Leveraging upon our technologically-advanced production facility, we are highly engaged in manufacturing and supplying Automatic Side Sealer Tunnel. 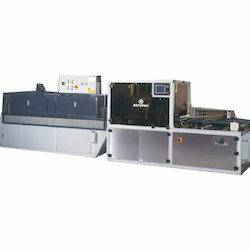 GH-6030AF Fully-auto horizontal double side sealer which is developed for special big items adopts an advanced high-speed double-sided sealing technology. While the items are going forward, the side sealing system starts to seal and cut the up & down film that keeps good sealing. Continuous sealing & cutting and no limits on the item length makes particularly suitable for longer, wider and heavy products. Looking for Automatic Side Sealer Tunnel ?